This month we’ve been looking at the potential of scaling up Transition, what the obstacles to doing that might be, and a range of perspectives on what’s needed to enable that to happen. 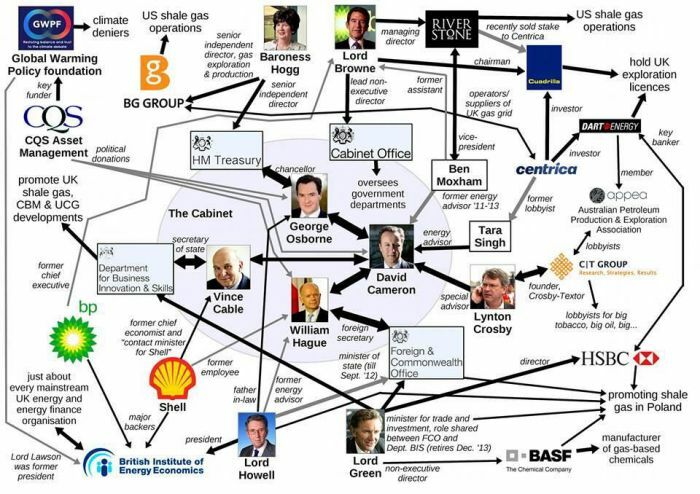 Right in the middle of that, David Cameron announced last week that the UK is now going “all out for fracking”, and urging people to get behind the process. It’s as clear an indication as you could wish for that David Holmgren’s recent assertion that we are moving into a ‘Brown Tech’ scenario, where concerns about climate change are sidelined by an all-out push for what fossil fuel reserves remain, is what’s actually unfolding. But, although we’ve debated the pros and cons of fracking here before, is he right to say that shale gas is a good way to benefit communities? Over Christmas, during some of the most extreme weather the UK has seen, David Cameron visited flooded communities in Oxfordshire and told local people “we are doing everything we can”. “There is always more to do and lessons to be learnt and I’ll make sure we do that” he told reporters. Asked about the floods at Prime Minister’s Questions a few days later, he said that he “very much suspected” that the recent floods were the outcome of climate change. 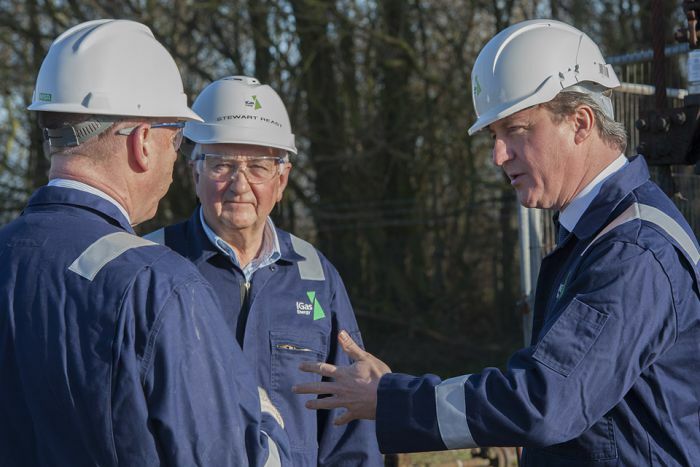 Now, the following week, he has announced this push for shale gas and trumpeted that it will bring great benefits to communities. Is fracking the best way to help improve public services? With spending cuts decimating public services across the country, local councils will now be able to keep all the business rates generated by local wells, up to £1.7 million for each well drilled. Justifiable concerns have been raised in terms of how the lure of such extra finance will undermine the impartiality of the council’s role as the planning authority that makes the decision as to whether each project can go ahead. With vital public services under threat, such cash will make a big difference to their being able to sustain essential public services. But there is a very real question of how much of the money potentially given to local authorities will simply go straight back out again in policing extremely unpopular fracking projects. For example, the policing bill for the protests against the Balcome site, presumably picked up by the local authority, rather than Cuadrilla, runs currently at about £3 million. The approach coming through Transition and other approaches of community-led development, community-ownership, building solutions to ‘leaky-bucket’ economics, and local authorities taking a central role in resilience-building, using their procurement and other approaches to help it happen, offer a far greater opportunity than money from fracking. Also, as our recent Austerity Basics series showed, cuts on the scale we are seeing them is not the only way forward from here, and to link much-needed finance to accepting fracking sites reeks of being deeply manipulative. Is it the best approach for building local resilience? “The thing about community energy is that it has two vital ingredients, community and renewable energy. Those are two key ingredients in the creation of resilient communities”, Agamemnon told me. Every year, London gives £12 billion to the Big Six energy companies to pay for its electricity and gas. The UK annually gives £178 billion. Whether that gas comes from Qatar or from gas fracked in Lancashire makes no difference to the resilience of local communities. It also, as is now clear, will make no difference to the cost, indeed both the International Energy Agency (IEA) and the UK government itself (see below) are predicting that the cost of gas will rise, 40% by 2020 according to the IEA. In a New York Times investigative article (“After the Boom in Natural Gas,” October 20, 2012), Clifford Krauss and Eric Lipton wrote, “Like the recent credit bubble, the boom and bust in gas were driven in large part by tens of billions of dollars in creative financing engineered by investment banks like Goldman Sachs, Barclays and Jefferies & Company.” The article details how this “creative financing” forced drillers to keep drilling even when each new well represented a financial loss. “Renewable energy and local ownership means that the energy could, in theory, be used locally to build resilience and self-sufficiency in an increasingly unstable energy environment”. Fracking is too capital intensive to allow communities to set up and run their own wells, even if they wanted to. Giving a tiny proportion of the income back really makes little difference. Income such as is being proposed is only one small part of the bigger picture of thinking about what a resilient community needs. Why will bribing communities not work? The idea that you just need to offer people money to get them to accept unpopular energy projects clearly doesn’t work. Some wind energy initiatives (including the unsuccessful Totnes Community Wind project) offered money to local communities, who saw it as a bribe, and it only strengthened their resolve to stop it happening. Money isn’t usually what motivates communities. Our experience in the Transition movement has shown us that ownership is. Renewable energy is ideal for that. As numerous projects have shown, communities can raise some or all of the finance they need in order to own local energy projects. If funding from government or elsewhere can enable communities to start building new resilient infrastructure and enterprises, then it’s a valuable approach. Bath & West Community Energy were provided with £1 million in debt finance at the outset by Scottish & Southern Energy (SSE), which enabled them to go out with a share offer founded on projects already being built that investors could see happening around them, which reduced risk and built confidence. This then enabled a model where local people invested £750,000 in a share launch, a significant number of them moving Self-Invested Pensions into the new model. That model is a far better approach than trying to buy off opinion. Also, as a local resident, it’s not like anyone gets a choice whether to accept it or not, they just get the money. And who does it go to, and who decides what to do with it? 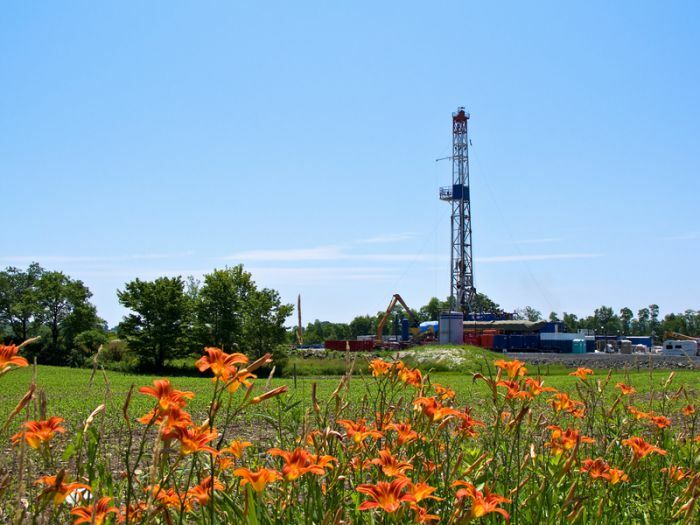 What might communities spend their fracking-derived income on? From a climate perspective, the idea that you might extract shale gas to raise the finance to build an integrated renewable energy system to power the community into the future doesn’t really work either, as given the additional carbon unleashed, you might be better off investing that money in rubber dingies and an Ark. Or at least adding the money to a fund for better flood defences and rubber dingies for flood-affected communities, or perhaps offsetting the impacts for families in flood areas whose insurance excess has gone up from a few hundred pounds to over £10,000. That carbon needs to stay in the ground. Does it centralise or decentralise power? “It’s not a black and white thing, but a civil war it is, and make no mistake, the threatened incumbency, as they see and smell the ultimate demise of their belief system, ever more clearly, are fighting as in many wars, the most bitter and horrid fighting is done towards the end of the war. You saw that with the Second World War in particular. The same thing is happening in the energy civil war right now”. You can see the big energy utilities dying basically. The top twenty European energy utilities were worth a trillion Euros in 2008. Now they’re worth half a trillion. That’s simply because of the way wind and solar particularly, but also other renewables have driven down the wholesale price and literally taken power out of the monopoly hands of the utilities. A report last week showed how shale gas executives and government officials worked together to manage the public reaction to last week’s news about fracking, and the cosy relationship between the two, critics arguing that the government was “acting as an arm of the gas industry”. The clinging to fossil fuels in spite of the clear dangers to the climate is leading now, in the US, to activists against fossil fuel companies being charged under terrorism legislation for hanging a banner and dropping glitter in an oil and gas company’s lobby. That’s not a path that a push for renewable energy would bring about, and one we must do everything possible to avoid. Fracking and nuclear power centralise power into fewer and fewer powerful hands when we need to be doing exactly the opposite. Is fracking the best way to decarbonise communities? “Shale gas – previously inaccessible because the exploitation of these resources requires technology only recently perfected – will account for a rising proportion of the growth in energy in the years to 2035, but its use will not cause a decline in greenhouse gases”. The core of their argument is that rather than displace coal, as shale gas advocates have anticipated, increased availability of shale gas has been accompanied by coal consumption rising to record levels. The world is hungry for hydrocarbons, and with no international cap on their use, it will burn whatever is brought to the market. It knows no restraint or self-control. “The production of shale gas could increase global cumulative GHG emissions if the fossil fuels displaced by shale gas are used elsewhere”. offers the prospect of low-carbon energy. Gas is a high carbon energy source, emitting half the quantity of carbon dioxide per unit of electricity generated as the worst and dirtiest energy source we know, coal. Half the worst is still very high emissions. is a transition fuel to a low-carbon future. Even the shale gas industry acknowledges that it will not produce significant quantities of shale gas before around 2025, by which time our international commitments on climate change would not permit it to be combusted in any significant quantities. According to DECC figures,1.61m lofts were fully insulated in 2012, but in the year to the end of October 2013, the most recent data released, just 110,000 had been treated, a pro-rata fall of 93%. For cavity wall insulation, measures fell from 640,000 in 2012 to 125,000 in the year to October 2013, a pro-rata fall of 77%. Just at the time we need a deep and far-reaching programme of energy conservation measures, we are seeing just the opposite. This creates a kind of self-fulfilling prophecy, where demand for shale gas can be demonstrated because the nation’s homes are so wasteful. We end up inviting a French company to help us heat the skies above our homes. Perhaps another useful approach could be for the government might also legislate for a different way to charge for energy. At the moment the Big Six all charge less the more energy you use, and many people live in fuel poverty. Last winter the UK saw 28,500 excess winter deaths, and huge profits for the companies. How about instead we say energy is free to everyone up to a very basic level, enough to ensure nobody freezes to death, also building in safeguards for poorer households which are more often all electric heated. Above that level, the price rises steeply. Money from those paying the most could go to energy efficiency measures for those on lowest incomes. It would reduce bureaucracy in terms of things like Winter Fuel Allowance. Given that many people are now used to the “basic service free, add-ons extra” model (Spotify, Soundcloud, YouTube etc), it could prove a popular approach. Will fracking create more jobs? “At its peak, some 16,000 – 32,000 full time equivalent (FTE) positions could be created”. The 74,000 figure apparently came from a report by the Institute of Directors, not from Cameron’s own government’s figures! Extraordinary. Secondly, an explosion of community-owned renewables and the push for local resilience that they could unlock could, I would suggest, do far better than that. A 2012 report from DECC found that just the renewable energy projects announced between 1 April 2011 and 31 July 2012 would create 22,800 jobs. Renewable Energy UK have stated that the UK offshore wind industry alone, with proper government support, could create over 70,000 jobs. A report by Centre for Alternative Technology, Zero Carbon Britain: rethinking the future, estimated that looked at across the different sectors, the low carbon economy could create 1.5 million new jobs. Most of the jobs created by fracking are not long-term jobs, they are not jobs over which the community has any say. Economies of scale will most likely mean national contractors drilling wells rather than local companies. What we see with fracking is the same extractive model we see with supermarkets and large developments: distant capital moving in to suit its own agenda with concern for their shareholders’ dividends, not the local economy. Fracking is no different. A bottom up approach, owned by, and designed to benefit local communities, such as Brixton Energy and Bath & West Community Energy, as well as a host of other community-led renewables projects, are modelling, brings control back to local people, a core foundation of resilience. And whose land/gas/resource is it anyway excuse me? For me there is also an ethical issue here that I haven’t seen addressed anywhere. Why is it OK for large energy companies to buy the rights from the government to a resource that really belongs to the people of this country, in order that they extract it, sell it back to us, take the bulk of the profits elsewhere, leave us with the mess, and having to live in the warmed and more unstable climate thus created? “We pumped hundreds of billions out of the water off the coast of Scotland. Only unlike the Norwegians, we’ve got almost nothing to show for it. Our oil cash was magicked into tax cuts for the well-off, then micturated against the walls of a thousand pricey car dealerships and estate agents”. Norway in the meantime has put away a fund which now holds the equivalent of £100,000 for every man, woman and child in the country to be held for future generations. We have nothing. The same will happen with fracking. So it looks to me to be community resilience 6, fracking 0. Given the absurdity, the unbelievable cheek of the whole thing and the deeply shady way in which this is being forced upon a disbelieving nation, it should come as no surprise that some aspects of this defy belief. I’ll leave you with the most remarkable, which was when energy minister Michael Fallon, on BBC Radio 4’s Today Programme last Monday, talked about shale gas in the context of “other renewable technologies”. It’s a smart strategy, especially when representing a government that has so effectively done so little to support renewable energy and energy efficiency – simply redefine “renewable”! It’s genius really, merely stretch the time frame and hey presto, drag it out to about 90 million years, and shale gas is a renewable energy source. Now, doesn’t that make life a lot easier?